Fellow Earth Mama and good friend, Meg sent me Last Child in the Woods as a birthday gift. I’m left to ponder, “has there ever been a better gift?”. I believe in limiting my children’s access to technology, in turning the television off (and I say THE because we have only one tv in our house), in putting on the wellies and getting outside. Unfortunately many children spend far to much time indoors. Schools are limiting P.E. and recess. Kids wile away the afternoons playing video games and hanging out in virtual rooms online. We are seeing rising rates of childhood obesity, diabetes, ADD & ADHD, lethargy and depression. That’s not the future I want for my children. Looking back on my childhood, we were seldom inside. We spent hour upon hour outside making dirt tracks under the big oak tree, riding bicycles, playing red rover, gardening and making many a mud pie. Heck, I remember dissecting dragonflies, slicing a worm between its hearts to make several worms and allowing potato bugs to crawl on my hands. 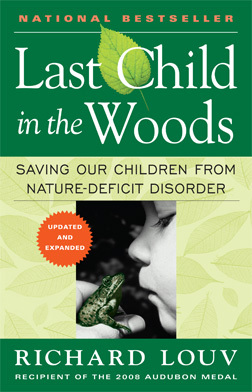 In Last Child in the Woods, Richard Louv points out that the children of today are well versed in global warming and can recycle with the best of us, however they are not experiencing nature. Their very goal is to preserve nature but they do not enjoy what we are striving so hard to protect. Read the book. Make a plan. Live the plan. Even if you start small (got 15 minutes?) its a step in the right direction. If the kids usually watch 2 hours of tv, cut it down and chase them outside and get yourself out there too! I know that I’m much too tempted to use that time cleaning the house or catching up on paperwork. I don’t believe in the motto “do as I say, not as I do”. Lead by example. Does rain mean you are stuck inside crafting and having movie days? No way, rain is an opportunity to gear up and take a walk… look for things that you don’t see when its dry out. Watch a giant earthworm work his way across the road. Notice the colors that show up in wet pebbles. Feel the squishy mud under your feet. Splash in puddles. Talk about clouds, rainbows and keeping our air clean so that the rain stays clean. Consider a project like rain collection barrels that you can use later to water your garden. We have added new things to our outdoor plans this year including building a treehouse. The first step is to locate whatever second hand items we can find (Know someone in building? They can probably hook you up with some good lumber from an old house). The next step will be to compile those found pieces into a fort. The kids don’t care if it’s fancy, they just want a cool place to hang out and keep their collections of rocks, twigs, and leaves. Whatever your family enjoys, get outside and do it. A picnic on the lawn, laying out on a blanket at night star gazing, taking a mini hike to a nearby river or falls, camping in your yard, playing in the dirt. If you are lacking in outdoor activity ideas, you’ll find plenty in Last Child in the Woods. I couldn’t agree more. We are trying to move to the “country” to combat this problem. Let them climb TREES. Real live, you might break an arm if you fall, TREES. Yes, they might break an arm but WE all lived through such harrowing dangers. And our kids will too. Cut the cord. Let them grow! Great post, Jamie! Louv’s books is an important one, and as a chldren’s physical activity specialist, I’m thrilled that you’re spreading the message among your readers and offering simple, actionable ideas!